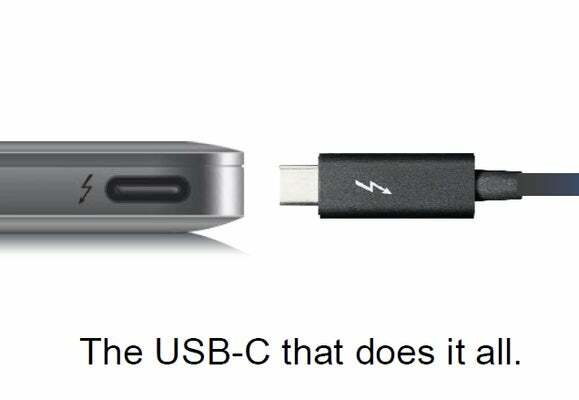 Thunderbolt's not dead—even though Apple, once its a biggest proponent, left it out of the new 12-inch MacBook, and USB 3.0 and USB 3.1 have proliferated because of their low cost. With ThunderboIt 3, introduced by Intel during the Computex tradeshow in Taiwan on Tuesday, the connector technology is back and bigger than ever. It also marries with USB-C, in a bid for future products that can take advantage of both connectors' strengths. One of those strengths will be speed. Intel said Thunderbolt 3 doubles the previous bandwidth, offers 100 watts of charging—and will run over a USB-C connector. It will offer four times the data and and twice the video bandwidth of any other cable. The original Thunderbolt hit 10Gbps, while the second iteration reached 20Gbps, said Intel Senior VP Kirk Skaugen. Thunderbolt 3 will hit 40Gbps. That's enough, Intel officials said, to carry two 4K signals at 60Hz or drive a 5K monitor by itself. Despite the 5K nomenclature, 5K monitors actually carry 70 percent more pixels than a 4K monitor. 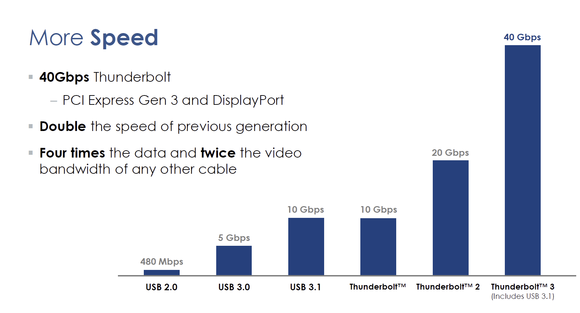 Why this matters: Thunderbolt 3's new features position it to handle the next generation of demanding display technologies and all external I/O, and the insatiable desire of all tech these days to pump more data faster through the pipes. Also, the alliance with USB-C hitches Thunderbolt to a rising star that will help future-proof it. Thunderbolt 3 doubles the speed over its precedessor. Intel said the codename for its Thunderbolt 3 chip is Alpine Ridge and will be among the first host controllers to support USB 3.1 at 10Gbps. 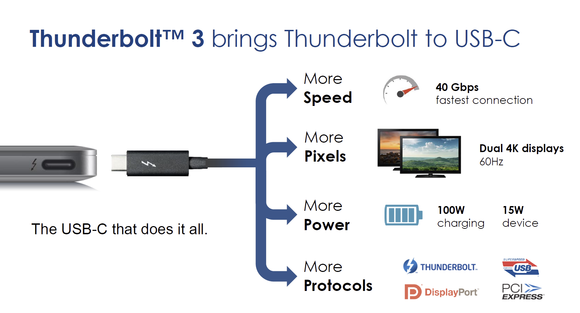 Intel described Thunderbolt 3 as having "enough speed to dock everything." Yes, that boldface is Intel's. Because Thunderbolt carries multiple protocols including USB, PCIe, DisplayPort and even Ethernet, Intel said it will essentially be 10Gb ethernet "for free" in small peer-to-peer networks. The new protocol will work over passive copper cables at up to Thunderbolt 2 speeds of 20Gbps and up to 2 meters. With active copper cables the speed increases to 40Gbps but is still limited to 2-meter cables. Longer distances, up to 60 meters, Intel said, will require active optical cables, but that's not expected until next year at the earliest. Thunderbolt 3 peripherals and computers are expected as soon as the end of this year.